After cresting earlier this week, the Mississippi River has started to fall from Dubuque to Muscatine. But it won't fall very much more, and then will hold for several days at least, a couple of feet or more above flood stage. The National Weather Service says it's down one foot in Dubuque since Tuesday, and should stay at about 3.7 feet above flood stage for a day or two, and then rise about half a foot. The Mississippi has also fallen about 1 foot at Clinton, to 3.7 feet over flood stage. And it should stay at that level through next weekend. In the Quad Cities, the river has dropped half a foot to 5 feet over flood stage. It should fall a bit more, and then hold there through next weekend. 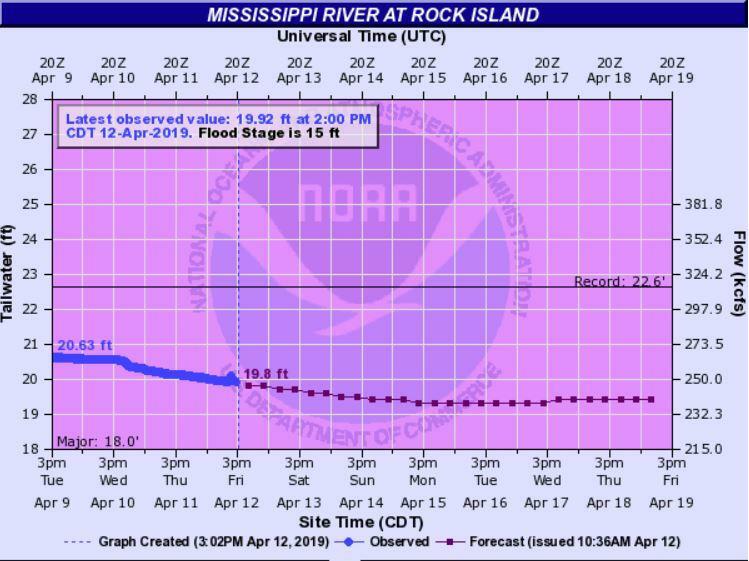 The river has fallen at Muscatine three-quarters of a foot since Tuesday, and will drop a bit more then stay at that level through next weekend.